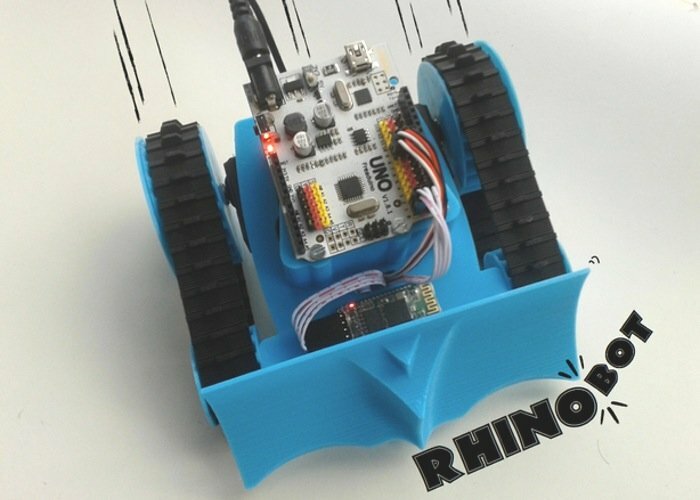 If you fancy building your very own robot you might be interested in the PrintBot RHINO which is an educational robot that has been designed to be able to push objects with this 3D printed dozer attachment as well as take part in “sumobots fights”. The RhinoBOT is an open source and 3D printed robot that is fun to build and easy to expand, and the latest designs from Miguel Carro who runs a DIY robotic blog have now been made available for the latest RhinoBOT. The plans are available on the 3D print library Thingiverse, check out the video below to learn more about the RhinoBOT and see it in action. For more information on the RhinoBOT DIY Robot jump over to the Thingiverse website for details, a full list of all the required components and electronics are listed together with full instructions on how to create your very own RhinoBOT.